Review: How Do I Begin? The NY Times began the new year with a piece about the Hmong American Writers’ Circle and the cultural context in which it operates. And our most recent issue of the Lantern Review put a spotlight on HAWC in Community Voices. This is only the beginning of much-deserved attention for this unique generation of new writers. 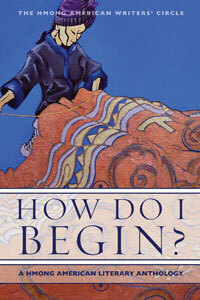 How Do I Begin is an apt title for an anthology of writers whose ethnic identity is doubly marginalized: though the Hmong roots are in southwest China, most emigrated/fled to the US from places like Laos or Vietnam after the Vietnam-American War. Burlee Vang, in his introduction to the book, describes himself as “born into a people whose written language has long been substituted by an oral tradition.” The written language of the Hmong was lost after assimilation in Imperial China long ago; this is not to mention assimilation into Thai and Lao culture, where most Hmong are provided an education only in their host countries’ official languages. The Hmong language has remnants in traditional embroidery but they have become indecipherable. Writers identifying as Hmong American today, therefore, have the tremendous task not only of writing themselves into history and literature, but also of gathering their names and identities from the pieces available. English is their adopted language, and so these writers must weave a warp and woof through multiple traditions. plaintains, lychees, longans, and mangoes. That is a blink of longed-for recognition from authorities, and it is a blink that quickens the gap between the alien and the invisible. There is a self-estrangement involved in all writing, in the creation of all memories, and it is useful to consider Ka Vang’s formulation: “Being Hmong makes me a better writer and being a writer makes me a better Hmong.” This awareness of a split identity is one of upward lift, like two waves rising in their collision. There is often the implication that ethnicity can be separated or masked in writing. This cannot be done any more than we can disguise the time in which we write. [. . .] my work remains, and that is my true body.